Microsoft, the world's largest software maker, has said the next version of its much-delayed operating system will be known as Windows Vista. The software, until now known by its code name Longhorn, is due for release towards the end of 2006, half a decade after the launch of Windows XP. To hit the deadline Microsoft has already taken out a number of features it had promised for the system. A test version will be released by 3 August, the Seattle-based firm said. Once Vista hits the market it will be the longest gap between releases of Windows systems. 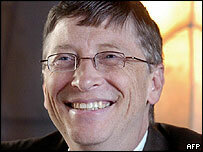 On Thursday Microsoft announced fourth-quarter net profits of $3.7bn (£2.11bn) for the three months up to 30 June 2005. Chief financial officer Chris Liddell said Microsoft would benefit greatly in the next financial year from new products. Microsoft's flagship software already runs on about 90% of personal computers worldwide. The firm has promised that Vista will take what for Microsoft is a completely new approach to computing, with security not an add-on but an integral part of the operating system. One of its most important features could be the promised seamless integration with a vast range of computing devices - from media centres to wireless music players. According to Brad Goldberg, general manager of Windows product development at Microsoft, the renaming is in the interests of "communicating the idea of clarity". "That lets users focus on the things they need to focus on," he added. 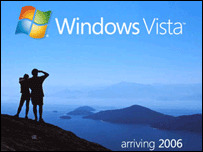 A video of the launch showed the Vista brand name alongside the slogan "Clear, Confident, Connected; Bringing clarity to your world". Microsoft has previously said that Vista will make malicious software that gets onto computers without the users' knowledge "a thing of the past". Executives at the firm have said Vista, which is likely to run on high-specification computers only, has been designed with security as "part of the design, not a bolt-on".